We are working to provide you with BBQ tips that really work to improve the quality of your next barbecue. One of the ways we are doing that is with our 10 Easy BBQ Tips That Actually Work. Read through our suggestions on ways to improve your next bbq. 1. These 10 Tips take into account the amount of money and time used by selecting the best cut of meat you can afford. There are not enough words that can be said when focusing on the quality of meats. Better than average meat improves the end result of barbecues. And the best way to ensure those results is by improving tenderness and flavor directly related to what part of the animal the meat comes from and also in a lesser way how you cook it. Your selection for beef will depend primarily on the purpose for the cut as well as key factors like color of the meat, cherry red, marbling or fat content, age of the cut and days until the meat is determined unsafe to eat. Buy the highest USDA grade available that is compatible with your purse strings. Be careful not to get caught up in the hype of supermarket "fantasy" names like Butcher's cut or Five Star Prime. The terms are focused on deception as they attempt to sell lesser quality meats for upper quality prices to an unknowing public. A tenderizing marinade contains a food acid or a tenderizing enzyme. Acidic ingredients include lemon or lime juice, vinegar, Italian dressing, salsa, yogurt and wine. Marinades are generally used with less tender beef cuts - usually from the chuck, round, flank and skirt marinating from 2 to 4 hours. Less tender steaks should be marinated at least 6 hours, but no more than 24 hours. Longer than 24 hours will result in a mushy texture. NEVER save and reuse a used marinade. Reuse may not only spoil or contaminate meat, but reused marinade may contain bacteria which can make you and your guests sick, costing you discomfort and certainly time. 3. Soak wood chips before using to prolong smoke and life. Soaking wood chips allows the wood to absorb the water causing longer periods of smoldering where smoke is produced. Always hold some chips aside that are continuously soaking in water. As the used chips burn add handfuls of new chips to keep up a continuous level of smoke. Dried wood chips will burn faster requiring more chips and thus will cost you more to maintain the same smoke level. 4. Never add lighter fluid directly to a flaming grill. Adding lighter fluid will not only produce carcinogens but will cause flare ups and may lead to trailing flames that follow the liquid into your container. The worst part is that lighter fluid can leave a sour taste to the meat spoiling your meal. 5. Using the right amount of heat to grill foods will save you time and money. Heat management is key to a great barbecue. Buy one or two small grill gauges that measure heat. Place the gauges at opposite corners of the grill and measure the heat. Add more charcoals or turn up the gas to keep a good average amount of heat. You will find that there are sections of the grill which are hotter and cooler. Keeping the heat managed will cook your meal evenly saving you time. 6. Thaw food properly before grilling. Improperly thawed foods will cook much like thawed foods and may produce the same signature texture when temperatures are measured. However, improperly thawed foods will remain cold and raw in the center and may actually increase production of bacteria when left out. Always allow meats to thaw properly in the refrigerator then properly season and grill. 7. Keeping food warm during transport is just as important as keeping warm when removed from the grill. Try out two or three of the methods to see which one works best for you. Water coolers can be used to keep food warm too. Line it with aluminum foil, and pad it with towels. Avoid having hot dishes touch the sides of the cooler directly so that it doesn't melt the plastic cooler. Make a hot water bath. You can put smaller pots or bowls into a bigger pot with a little bit of hot water, and then cover it. It will keep things nice, warm, and moist. Use a chafing dish. The high-end version of the water bath is to use a chafing dish. They can be pricey, but if you entertain a lot, they look nice on the table, and they're very convenient. ALDER: A subtle, medium smoky flavor. HICKORY: Heavy smoke flavor. One of the most popular woods. MESQUITE: Light, sweet and subtle. Another very popular wood. There are many other woods to use, however, always check online guides and information to make sure the wood you use is safe. Woods like Eucalyptus are known for their sub level poisonous nature and may not only cause illness but death, be careful to use woods that are commonly known for your safety. 9. Cleaning your grill before use can actually improve its performance and produce a better meal. Most grill manufacturers recommend cleaning your grill after every use. By cleaning the grill you actually allow the grill grates to heat to their intended temperature creating a better sear and grilling result on your meat. Caked on or charred on meats from previous grill sessions can actually distort the cooking temperature requiring more heat and time to cook your meal. 10. Using quality all natural barbecue sauce, dry rubs and marinades can not only improve the taste of the meal but increase the satisfaction of your guests. 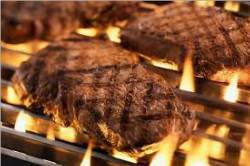 Barbecue sauces, dry rubs and marinades are all intended to tenderize the meat and add flavor. Lesser sauces, dry rubs and marinades use ingredients although not considered unsafe can actually collect to leave one feeling bloated and heavy. These ingredients may actually burn faster on the meat causing increased usage and thus more money to get the same flavor. A good quality, naturally made barbecue sauce, dry rub and marinade uses better, natural ingredients that tenderize the meat naturally. These ingredients will stay on the meat longer and will actually require less of the ingredients to do the same job of the cheaper sauces and dry rub. Using all natural ingredients will also help you stay in shape improving how you feel after the meal because they do not contain, corn syrup, MSG, high amounts of sodium, artificial sweeteners and strange chemical combinations. The end result you use less, get better flavor and your guests are happier for your effort. See what all the talk is about try Jake's All Natural BBQ Sauce, Dry Rub Seasonings and Marinades today. Be sure to see our new eBooks on 10 Easy BBQ tips where we cover these and many more amazing Barbecue facts. We hope you've enjoyed these BBQ Tips.